The Home Inspection Report you receive is prepared in accordance with the Standards of Practice of the Ontario Association of Home Inspectors. It is an industry leading computer generated Report that describes each of the major systems of the home including Roof, Exterior, Structure, Electrical, Heating, Cooling, Insulation and Ventilation, Plumbing and Interior. The Report addresses the condition of each of these systems and will document our findings in clear, concise terms. Recommended repairs, replacements or improvements are included. Interim Summary: An interim summary (The Big Picture) at the end of the Home Inspection to answer any questions or immediate concerns that you may have. The Report: A more detailed computer generated Report the same day as your Inspection. This includes photos and colour illustrations explaining components and links to relevant reference materials. The Report also contains a Summary of significant issues for quick reference. The Report can be downloaded and saved on the CD provided. Home Reference Library: Your Report will also contain links to the online version of the "Home Reference Book" containing 400 informative pages and 160 illustrations with detailed chapters on each of the main components in your home. This valuable resource includes information on how your home works, what wears out, life cycle of components, costs and maintenance suggestions. 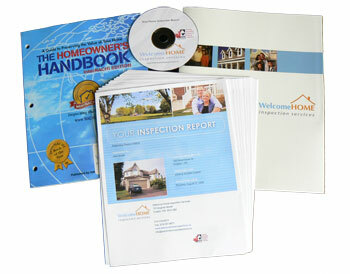 The Homeowners Handbook: A 96 page, full colour home maintenance manual that helps make sure that your home continues to be safe, comfortable and efficient. Welcome Home Inspection Services is committed to providing the highest quality Home Inspection, professional reporting system and reference material to our clients. You can be confident that you will be fully informed when making your buying or selling decision. 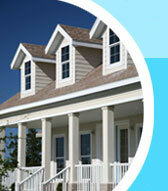 In addition we will be there for as long as you own your home to answer any questions that you may have in the future.